"Shoemaker–Levy" redirects here. For other Shoemaker–Levy comets, see List of periodic comets. "SL9" redirects here. For the German airship, see List of Schütte-Lanz airships. Comet Shoemaker–Levy 9 (formally designated D/1993 F2) was a comet that broke apart in July 1992 and collided with Jupiter in July 1994, providing the first direct observation of an extraterrestrial collision of Solar System objects. This generated a large amount of coverage in the popular media, and the comet was closely observed by astronomers worldwide. The collision provided new information about Jupiter and highlighted its possible role in reducing space debris in the inner Solar System. The comet was discovered by astronomers Carolyn and Eugene M. Shoemaker and David Levy in 1993. Shoemaker–Levy 9 had been captured by Jupiter and was orbiting the planet at the time. It was located on the night of March 24 in a photograph taken with the 46 cm (18 in) Schmidt telescope at the Palomar Observatory in California. It was the first comet observed to be orbiting a planet, and had probably been captured by Jupiter around 20–30 years earlier. Calculations showed that its unusual fragmented form was due to a previous closer approach to Jupiter in July 1992. At that time, the orbit of Shoemaker–Levy 9 passed within Jupiter's Roche limit, and Jupiter's tidal forces had acted to pull apart the comet. The comet was later observed as a series of fragments ranging up to 2 km (1.2 mi) in diameter. These fragments collided with Jupiter's southern hemisphere between July 16 and 22, 1994 at a speed of approximately 60 km/s (37 mi/s) (Jupiter's escape velocity) or 216,000 km/h (134,000 mph). The prominent scars from the impacts were more easily visible than the Great Red Spot and persisted for many months. 9 Jupiter as a "cosmic vacuum cleaner"
While conducting a program of observations designed to uncover near-Earth objects, the Shoemakers and Levy discovered Comet Shoemaker–Levy 9 on the night of March 24, 1993 in a photograph taken with the 0.46 m (1.5 ft) Schmidt telescope at the Palomar Observatory in California. The comet was thus a serendipitous discovery, but one that quickly overshadowed the results from their main observing program. Comet Shoemaker–Levy 9 was the ninth periodic comet (a comet whose orbital period is 200 years or less) discovered by the Shoemakers and Levy, hence its name. It was their eleventh comet discovery overall including their discovery of two non-periodic comets, which use a different nomenclature. The discovery was announced in IAU Circular 5725 on March 27, 1993. The discovery image gave the first hint that comet Shoemaker–Levy 9 was an unusual comet, as it appeared to show multiple nuclei in an elongated region about 50 arcseconds long and 10 arcseconds wide. Brian G. Marsden of the Central Bureau for Astronomical Telegrams noted that the comet lay only about 4 degrees from Jupiter as seen from Earth, and that although this could of course be a line of sight effect, its apparent motion in the sky suggested that it was physically close to it. Because of this, he suggested that the Shoemakers and David Levy had discovered the fragments of a comet that had been disrupted by Jupiter's gravity. Orbital studies of the new comet soon revealed that it was orbiting Jupiter rather than the Sun, unlike all other comets known at the time. Its orbit around Jupiter was very loosely bound, with a period of about 2 years and an apoapsis (the point in the orbit farthest from the planet) of 0.33 astronomical units (49 million kilometres; 31 million miles). Its orbit around the planet was highly eccentric (e = 0.9986). Tracing back the comet's orbital motion revealed that it had been orbiting Jupiter for some time. 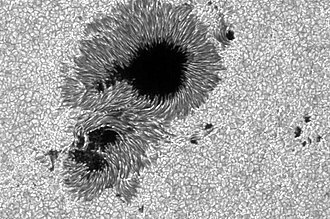 It is likely that it was captured from a solar orbit in the early 1970s, although the capture may have occurred as early as the mid-1960s. Several other observers found images of the comet in precovery images obtained before March 24, including Kin Endate from a photograph exposed on March 15, S. Otomo on March 17, and a team led by Eleanor Helin from images on March 19. No precovery images dating back to earlier than March 1993 have been found. Before the comet was captured by Jupiter, it was probably a short-period comet with an aphelion just inside Jupiter's orbit, and a perihelion interior to the asteroid belt. The volume of space within which an object can be said to orbit Jupiter is defined by Jupiter's Hill sphere (also called the Roche sphere). When the comet passed Jupiter in the late 1960s or early 1970s, it happened to be near its aphelion, and found itself slightly within Jupiter's Hill sphere. Jupiter's gravity nudged the comet towards it. Because the comet's motion with respect to Jupiter was very small, it fell almost straight toward Jupiter, which is why it ended up on a Jove-centric orbit of very high eccentricity—that is to say, the ellipse was nearly flattened out. The comet had apparently passed extremely close to Jupiter on July 7, 1992, just over 40,000 km (25,000 mi) above its cloud tops—a smaller distance than Jupiter's radius of 70,000 km (43,000 mi), and well within the orbit of Jupiter's innermost moon Metis and the planet's Roche limit, inside which tidal forces are strong enough to disrupt a body held together only by gravity. 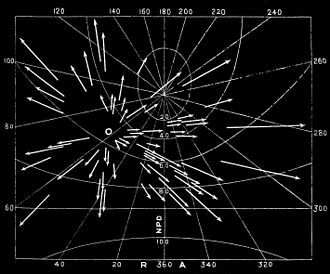 Although the comet had approached Jupiter closely before, the July 7 encounter seemed to be by far the closest, and the fragmentation of the comet is thought to have occurred at this time. Each fragment of the comet was denoted by a letter of the alphabet, from "fragment A" through to "fragment W", a practice already established from previously observed broken-up comets. More exciting for planetary astronomers was that the best orbital calculations suggested that the comet would pass within 45,000 km (28,000 mi) of the center of Jupiter, a distance smaller than the planet's radius, meaning that there was an extremely high probability that SL9 would collide with Jupiter in July 1994. Studies suggested that the train of nuclei would plow into Jupiter's atmosphere over a period of about five days. The discovery that the comet was likely to collide with Jupiter caused great excitement within the astronomical community and beyond, as astronomers had never before seen two significant Solar System bodies collide. Intense studies of the comet were undertaken, and as its orbit became more accurately established, the possibility of a collision became a certainty. The collision would provide a unique opportunity for scientists to look inside Jupiter's atmosphere, as the collisions were expected to cause eruptions of material from the layers normally hidden beneath the clouds. Astronomers estimated that the visible fragments of SL9 ranged in size from a few hundred metres (around 1,000 ft) to two kilometres (1.2 mi) across, suggesting that the original comet may have had a nucleus up to 5 km (3.1 mi) across—somewhat larger than Comet Hyakutake, which became very bright when it passed close to the Earth in 1996. One of the great debates in advance of the impact was whether the effects of the impact of such small bodies would be noticeable from Earth, apart from a flash as they disintegrated like giant meteors. The most optimistic prediction was that large, asymmetric ballistic fireballs would rise above the limb of Jupiter and into sunlight to be visible from Earth. Other suggested effects of the impacts were seismic waves travelling across the planet, an increase in stratospheric haze on the planet due to dust from the impacts, and an increase in the mass of the Jovian ring system. 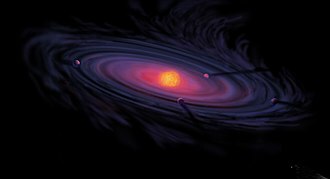 However, given that observing such a collision was completely unprecedented, astronomers were cautious with their predictions of what the event might reveal. Jupiter in ultraviolet (about 2.5 hours after R's impact). 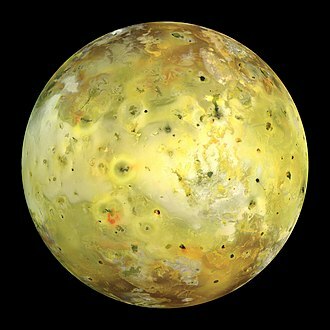 The black dot near the top is Io transiting Jupiter. Anticipation grew as the predicted date for the collisions approached, and astronomers trained terrestrial telescopes on Jupiter. Several space observatories did the same, including the Hubble Space Telescope, the ROSAT X-ray-observing satellite, and significantly the Galileo spacecraft, then on its way to a rendezvous with Jupiter scheduled for 1995. Although the impacts took place on the side of Jupiter hidden from Earth, Galileo, then at a distance of 1.6 AU (240 million km; 150 million mi) from the planet, was able to see the impacts as they occurred. Jupiter's rapid rotation brought the impact sites into view for terrestrial observers a few minutes after the collisions. Two other space probes made observations at the time of the impact: the Ulysses spacecraft, primarily designed for solar observations, was pointed towards Jupiter from its location 2.6 AU (390 million km; 240 million mi) away, and the distant Voyager 2 probe, some 44 AU (6.6 billion km; 4.1 billion mi) from Jupiter and on its way out of the Solar System following its encounter with Neptune in 1989, was programmed to look for radio emission in the 1–390 kHz range and make observations with its ultraviolet spectrometer. The first impact occurred at 20:13 UTC on July 16, 1994, when fragment A of the nucleus entered Jupiter's southern hemisphere at a speed of about 60 km/s (35 mi/s). Instruments on Galileo detected a fireball that reached a peak temperature of about 24,000 K (23,700 °C; 42,700 °F), compared to the typical Jovian cloudtop temperature of about 130 K (−143 °C; −226 °F), before expanding and cooling rapidly to about 1,500 K (1,230 °C; 2,240 °F) after 40 seconds. The plume from the fireball quickly reached a height of over 3,000 km (1,900 mi). A few minutes after the impact fireball was detected, Galileo measured renewed heating, probably due to ejected material falling back onto the planet. Earth-based observers detected the fireball rising over the limb of the planet shortly after the initial impact. Despite published predictions, astronomers had not expected to see the fireballs from the impacts and did not have any idea in advance how visible the other atmospheric effects of the impacts would be from Earth. Observers soon saw a huge dark spot after the first impact. The spot was visible even in very small telescopes, and was about 6,000 km (3,700 mi) (one Earth radius) across. This and subsequent dark spots were thought to have been caused by debris from the impacts, and were markedly asymmetric, forming crescent shapes in front of the direction of impact. Over the next six days, 21 distinct impacts were observed, with the largest coming on July 18 at 07:33 UTC when fragment G struck Jupiter. This impact created a giant dark spot over 12,000 km (7,500 mi) across, and was estimated to have released an energy equivalent to 6,000,000 megatons of TNT (600 times the world's nuclear arsenal). Two impacts 12 hours apart on July 19 created impact marks of similar size to that caused by fragment G, and impacts continued until July 22, when fragment W struck the planet. Observers hoped that the impacts would give them a first glimpse of Jupiter beneath the cloud tops, as lower material was exposed by the comet fragments punching through the upper atmosphere. Spectroscopic studies revealed absorption lines in the Jovian spectrum due to diatomic sulfur (S2) and carbon disulfide (CS2), the first detection of either in Jupiter, and only the second detection of S2 in any astronomical object. Other molecules detected included ammonia (NH3) and hydrogen sulfide (H2S). The amount of sulfur implied by the quantities of these compounds was much greater than the amount that would be expected in a small cometary nucleus, showing that material from within Jupiter was being revealed. Oxygen-bearing molecules such as sulfur dioxide were not detected, to the surprise of astronomers. As well as these molecules, emission from heavy atoms such as iron, magnesium and silicon was detected, with abundances consistent with what would be found in a cometary nucleus. Although a substantial amount of water was detected spectroscopically, it was not as much as predicted beforehand, meaning that either the water layer thought to exist below the clouds was thinner than predicted, or that the cometary fragments did not penetrate deeply enough. As predicted beforehand, the collisions generated enormous waves that swept across Jupiter at speeds of 450 m/s (1,476 ft/s) and were observed for over two hours after the largest impacts. The waves were thought to be travelling within a stable layer acting as a waveguide, and some scientists thought the stable layer must lie within the hypothesised tropospheric water cloud. However, other evidence seemed to indicate that the cometary fragments had not reached the water layer, and the waves were instead propagating within the stratosphere. Radio observations revealed a sharp increase in continuum emission at a wavelength of 21 cm (8.3 in) after the largest impacts, which peaked at 120% of the normal emission from the planet. 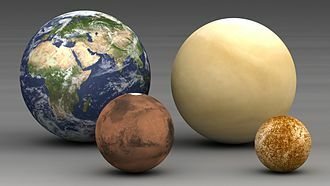 This was thought to be due to synchrotron radiation, caused by the injection of relativistic electrons—electrons with velocities near the speed of light—into the Jovian magnetosphere by the impacts. About an hour after fragment K entered Jupiter, observers recorded auroral emission near the impact region, as well as at the antipode of the impact site with respect to Jupiter's strong magnetic field. The cause of these emissions was difficult to establish due to a lack of knowledge of Jupiter's internal magnetic field and of the geometry of the impact sites. 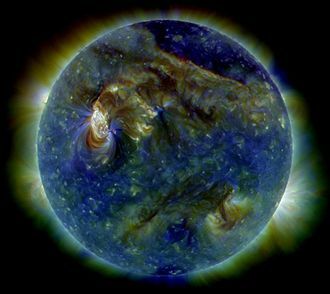 One possible explanation was that upwardly accelerating shock waves from the impact accelerated charged particles enough to cause auroral emission, a phenomenon more typically associated with fast-moving solar wind particles striking a planetary atmosphere near a magnetic pole. Some astronomers had suggested that the impacts might have a noticeable effect on the Io torus, a torus of high-energy particles connecting Jupiter with the highly volcanic moon Io. High resolution spectroscopic studies found that variations in the ion density, rotational velocity, and temperatures at the time of impact and afterwards were within the normal limits. Voyager 2 failed to detect anything with calculations showing that the fireballs were just below the craft’s limit of detection. Ulysses also failed to detect anything. Several models were devised to compute the density and size of Shoemaker–Levy 9. Its average density was calculated to be about 0.5 g/cm3 (0.018 lb/cu in); the breakup of a much less dense comet would not have resembled the observed string of objects. The size of the parent comet was calculated to be about 1.8 km (1.1 mi) in diameter. These predictions were among the few that were actually confirmed by subsequent observation. One of the surprises of the impacts was the small amount of water revealed compared to prior predictions. Before the impact, models of Jupiter's atmosphere had indicated that the break-up of the largest fragments would occur at atmospheric pressures of anywhere from 30 kilopascals to a few tens of megapascals (from 0.3 to a few hundred bar), with some predictions that the comet would penetrate a layer of water and create a bluish shroud over that region of Jupiter. 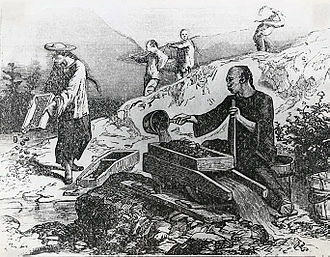 Astronomers did not observe large amounts of water following the collisions, and later impact studies found that fragmentation and destruction of the cometary fragments in an 'airburst' probably occurred at much higher altitudes than previously expected, with even the largest fragments being destroyed when the pressure reached 250 kPa (36 psi), well above the expected depth of the water layer. The smaller fragments were probably destroyed before they even reached the cloud layer. The visible scars from the impacts could be seen on Jupiter for many months. They were extremely prominent, and observers described them as even more easily visible than the Great Red Spot. A search of historical observations revealed that the spots were probably the most prominent transient features ever seen on the planet, and that although the Great Red Spot is notable for its striking color, no spots of the size and darkness of those caused by the SL9 impacts have ever been recorded before. Spectroscopic observers found that ammonia and carbon disulfide persisted in the atmosphere for at least fourteen months after the collisions, with a considerable amount of ammonia being present in the stratosphere as opposed to its normal location in the troposphere. 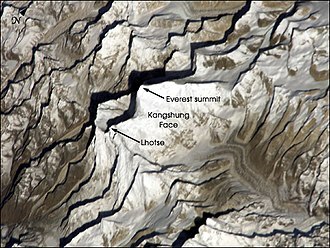 Counterintuitively, the atmospheric temperature dropped to normal levels much more quickly at the larger impact sites than at the smaller sites: at the larger impact sites, temperatures were elevated over a region 15,000 to 20,000 km (9,300 to 12,400 mi) wide, but dropped back to normal levels within a week of the impact. At smaller sites, temperatures 10 K (18 °F) higher than the surroundings persisted for almost two weeks. Global stratospheric temperatures rose immediately after the impacts, then fell to below pre-impact temperatures 2–3 weeks afterwards, before rising slowly to normal temperatures. SL9 is not unique in having orbited Jupiter for a time; five comets, (including 82P/Gehrels, 147P/Kushida–Muramatsu, and 111P/Helin–Roman–Crockett) are known to have been temporarily captured by the planet. Cometary orbits around Jupiter are unstable, as they will be highly elliptical and likely to be strongly perturbed by the Sun's gravity at apojove (the furthest point on the orbit from the planet). By far the most massive planet in the Solar System, Jupiter can capture objects relatively frequently, but the size of SL9 makes it a rarity: one post-impact study estimated that comets 0.3 km (0.19 mi) in diameter impact the planet once in approximately 500 years and those 1.6 km (0.99 mi) in diameter do so just once in every 6,000 years. There is very strong evidence that comets have previously been fragmented and collided with Jupiter and its satellites. During the Voyager missions to the planet, planetary scientists identified 13 crater chains on Callisto and three on Ganymede, the origin of which was initially a mystery. 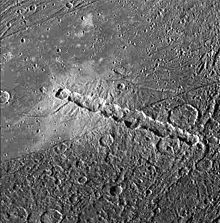 Crater chains seen on the Moon often radiate from large craters, and are thought to be caused by secondary impacts of the original ejecta, but the chains on the Jovian moons did not lead back to a larger crater. The impact of SL9 strongly implied that the chains were due to trains of disrupted cometary fragments crashing into the satellites. On July 19, 2009, exactly 15 years after the SL9 impacts, a new black spot about the size of the Pacific Ocean appeared in Jupiter's southern hemisphere. Thermal infrared measurements showed the impact site was warm and spectroscopic analysis detected the production of excess hot ammonia and silica-rich dust in the upper regions of Jupiter's atmosphere. Scientists have concluded that another impact event had occurred, but this time a more compact and strong object, probably a small undiscovered asteroid, was the cause. Jupiter as a "cosmic vacuum cleaner"
The impact of SL9 highlighted Jupiter's role as a "cosmic vacuum cleaner" (or in deference to the ancients' planetary correspondences to the major organs in the human body, a "cosmic liver") for the inner Solar System (Jupiter Barrier). The planet's strong gravitational influence leads to many small comets and asteroids colliding with the planet, and the rate of cometary impacts on Jupiter is thought to be between 2,000–8,000 times higher than the rate on Earth. The extinction of the dinosaurs at the end of the Cretaceous period is generally thought to have been caused by the Cretaceous–Paleogene impact event, which created the Chicxulub crater, demonstrating that impacts are a serious threat to life on Earth. Astronomers have speculated that without Jupiter to mop up potential impactors, extinction events might have been more frequent on Earth, and complex life might not have been able to develop. This is part of the argument used in the Rare Earth hypothesis. In 2009, it was shown that the presence of a smaller planet at Jupiter's position in the Solar System might increase the impact rate of comets on the Earth significantly. A planet of Jupiter's mass still seems to provide increased protection against asteroids, but the total effect on all orbital bodies within the Solar System is unclear. Computer simulations in 2016 have continued to erode the theory. ^ Howell, E. (February 19, 2013). "Shoemaker–Levy 9: Comet's Impact Left Its Mark on Jupiter". Space.com. ^ a b Solem, J. C. (1995). "Cometary breakup calculations based on a gravitationally-bound agglomeration model: The density and size of Comet Shoemaker-Levy 9". Astronomy and Astrophysics. 302 (2): 596–608. Bibcode:1995A&A...302..596S. ^ a b Solem, J. C. (1994). "Density and size of Comet Shoemaker–Levy 9 deduced from a tidal breakup model". Nature. 370 (6488): 349–351. Bibcode:1994Natur.370..349S. doi:10.1038/370349a0. 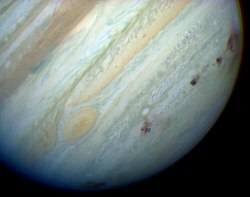 ^ a b "Comet Shoemaker–Levy 9 Collision with Jupiter". National Space Science Data Center. February 2005. Archived from the original on February 25, 2013. Retrieved August 26, 2008. ^ a b c Marsden, B. G. (1993). "Comet Shoemaker-Levy (1993e)". IAU Circular. 5725. ^ Marsden, Brian G. (July 18, 1997). "Eugene Shoemaker (1928–1997)". Jet Propulsion Laboratory. Retrieved August 24, 2008. ^ a b c Burton, Dan (July 1994). "What will be the effect of the collision?". Frequently Asked Questions about the Collision of Comet Shoemaker–Levy 9 with Jupiter. Stephen F. Austin State University. Archived from the original on February 25, 2013. Retrieved August 20, 2008. ^ Landis, R. R. (1994). "Comet P/Shoemaker–Levy's Collision with Jupiter: Covering HST's Planned Observations from Your Planetarium". Proceedings of the International Planetarium Society Conference held at the Astronaut Memorial Planetarium & Observatory, Cocoa, Florida, July 10–16, 1994. SEDS. Archived from the original on August 8, 2008. Retrieved August 8, 2008. ^ "D/1993 F2 Shoemaker–Levy 9". Gary W. Kronk's Cometography. 1994. Archived from the original on May 9, 2008. Retrieved August 8, 2008. ^ Benner, L. A.; McKinnon, W. B. (March 1994). "Pre-Impact Orbital Evolution of P/Shoemaker–Levy 9". Abstracts of the 25th Lunar and Planetary Science Conference, Held in Houston, TX, March 14–18, 1994. 25: 93. Bibcode:1994LPI....25...93B. ^ a b c Chapman, C. R. (June 1993). "Comet on target for Jupiter". Nature. 363 (6429): 492–493. Bibcode:1993Natur.363..492C. doi:10.1038/363492a0. ^ Boehnhardt, H. (November 2004). "Split comets". In M. C. Festou, H. U. Keller and H. A. Weaver. Comets II. University of Arizona Press. p. 301. ISBN 978-0-8165-2450-1. ^ Marsden, B. G. (1993). "Periodic Comet Shoemaker-Levy 9 (1993e)". IAU Circular. 5800. ^ a b Bruton, Dan (July 1994). "Can I see the effects with my telescope?". Frequently Asked Questions about the Collision of Comet Shoemaker–Levy 9 with Jupiter. Stephen F. Austin State University. Archived from the original on February 25, 2013. Retrieved August 20, 2008. ^ a b Boslough, Mark B.; Crawford, David A.; Robinson, Allen C.; Trucano, Timothy G. (July 5, 1994). "Watching for Fireballs on Jupiter". Eos, Transactions, American Geophysical Union. 75 (27): 305. Bibcode:1994EOSTr..75..305B. doi:10.1029/94eo00965. ^ "Hubble Ultraviolet Image of Multiple Comet Impacts on Jupiter". News Release Number: STScI-1994-35. Hubble Space Telescope Comet Team. July 23, 1994. Retrieved November 12, 2014. ^ Yeomans, D.K. (December 1993). "Periodic comet Shoemaker–Levy 9 (1993e)". IAU Circular. 5909. Retrieved July 5, 2011. ^ a b Williams, David R. "Ulysses and Voyager 2". Lunar and Planetary Science. National Space Science Data Center. Retrieved August 25, 2008. ^ Weissman, P.R. ; Carlson, R. W.; Hui, J.; Segura, M.; Smythe, W. D.; Baines, K. H.; Johnson, T. V.; Drossart, P.; Encrenaz, T.; et al. (March 1995). 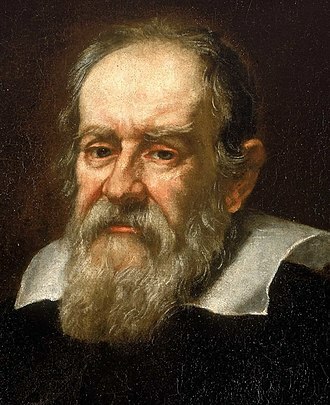 "Galileo NIMS Direct Observation of the Shoemaker–Levy 9 Fireballs and Fall Back". Abstracts of the Lunar and Planetary Science Conference. 26: 1483. Bibcode:1995LPI....26.1483W. ^ Weissman, Paul (July 14, 1994). "The Big Fizzle is coming". Nature. 370 (6485): 94–95. Bibcode:1994Natur.370...94W. doi:10.1038/370094a0. ^ Hammel, H.B. (December 1994). The Spectacular Swan Song of Shoemaker–Levy 9. 185th AAS Meeting. 26. American Astronomical Society. p. 1425. Bibcode:1994AAS...185.7201H. ^ Bruton, Dan (February 1996). "What were some of the effects of the collisions?". Frequently Asked Questions about the Collision of Comet Shoemaker–Levy 9 with Jupiter. Stephen F. Austin State University. Retrieved January 27, 2014. ^ Yeomans, Don; Chodas, Paul (March 18, 1995). "Comet Crash Impact Times Request". Jet Propulsion Laboratory. Retrieved August 26, 2008. ^ Noll, K.S. ; McGrath, MA; Trafton, LM; Atreya, SK; Caldwell, JJ; Weaver, HA; Yelle, RV; Barnet, C; Edgington, S (March 1995). "HST Spectroscopic Observations of Jupiter Following the Impact of Comet Shoemaker–Levy 9". Science. 267 (5202): 1307–1313. Bibcode:1995Sci...267.1307N. doi:10.1126/science.7871428. PMID 7871428. ^ a b c Hu, Zhong-Wei; Chu, Yi; Zhang, Kai-Jun (May 1996). "On Penetration Depth of the Shoemaker–Levy 9 Fragments into the Jovian Atmosphere". Earth, Moon, and Planets. 73 (2): 147–155. Bibcode:1996EM&P...73..147H. doi:10.1007/BF00114146. ^ Ingersoll, A. P.; Kanamori, H (April 1995). "Waves from the collisions of comet Shoemaker–Levy 9 with Jupiter". Nature. 374 (6524): 706–708. Bibcode:1995Natur.374..706I. doi:10.1038/374706a0. PMID 7715724. 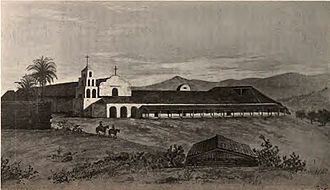 ^ Olano, C. A. (August 1999). "Jupiter's Synchrotron Emission Induced by the Collision of Comet Shoemaker–Levy 9". Astrophysics and Space Science. 266 (3): 347–369. Bibcode:1999Ap&SS.266..347O. doi:10.1023/A:1002020013936. ^ Bauske, Rainer; Combi, Michael R.; Clarke, John T. (November 1999). "Analysis of Midlatitude Auroral Emissions Observed during the Impact of Comet Shoemaker–Levy 9 with Jupiter". Icarus. 142 (1): 106–115. Bibcode:1999Icar..142..106B. doi:10.1006/icar.1999.6198. ^ Brown, Michael E.; Moyer, Elisabeth J.; Bouchez, Antonin H.; Spinrad, Hyron (1995). "Comet Shoemaker–Levy 9: No Effect on the Io Plasma Torus" (PDF). Geophysical Research Letters. 22 (3): 1833–1835. Bibcode:1995GeoRL..22.1833B. doi:10.1029/95GL00904. ^ Ulivi, Paolo; Harland, David M (2007). Robotic Exploration of the Solar System Part I: The Golden Age 1957-1982. Springer. p. 449. ISBN 9780387493268. ^ Noll, Keith S.; Weaver, Harold A.; Feldman, Paul D . (2006). Proceedings of Space Telescope Science Institute Workshop, Baltimore, MD, May 9–12, 1995, IAU Colloquium 156: The Collision of Comet Shoemaker-Levy 9 and Jupiter. Cambridge University Press. Archived from the original on November 24, 2015. ^ Loders, Katharina; Fegley, Bruce (1998). "Jupiter, Rings and Satellites". The Planetary Scientist's Companion. Oxford University Press. p. 200. ISBN 978-0-19-511694-6. ^ Hockey, T.A. (1994). "The Shoemaker–Levy 9 Spots on Jupiter: Their Place in History". Earth, Moon, and Planets. 66 (1): 1–9. Bibcode:1994EM&P...66....1H. doi:10.1007/BF00612878. ^ McGrath, M.A. ; Yelle, R. V.; Betremieux, Y. (September 1996). "Long-term Chemical Evolution of the Jupiter Stratosphere Following the SL9 Impacts". Bulletin of the American Astronomical Society. 28: 1149. Bibcode:1996DPS....28.2241M. ^ Bézard, B. (October 1997). "Long-term Response of Jupiter's Thermal Structure to the SL9 Impacts". Planetary and Space Science. 45 (10): 1251–1271. Bibcode:1997P&SS...45.1251B. doi:10.1016/S0032-0633(97)00068-8. ^ Moreno, R.; Marten, A; Biraud, Y; Bézard, B; Lellouch, E; Paubert, G; Wild, W (June 2001). "Jovian Stratospheric Temperature during the Two Months Following the Impacts of Comet Shoemaker–Levy 9". Planetary and Space Science. 49 (5): 473–486. 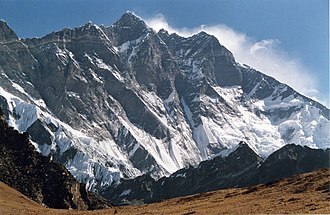 Bibcode:2001P&SS...49..473M. doi:10.1016/S0032-0633(00)00139-2. ^ Ohtsuka, Katsuhito; Ito, T.; Yoshikawa, M.; Asher, D. J.; Arakida, H. (October 2008). "Quasi-Hilda comet 147P/Kushida–Muramatsu. Another long temporary satellite capture by Jupiter". Astronomy and Astrophysics. 489 (3): 1355–1362. arXiv:0808.2277. Bibcode:2008A&A...489.1355O. doi:10.1051/0004-6361:200810321. ^ Tancredi, G.; Lindgren, M.; Rickman, H. (November 1990). "Temporary Satellite Capture and Orbital Evolution of Comet P/Helin–Roman–Crockett". Astronomy and Astrophysics. 239 (1–2): 375–380. Bibcode:1990A&A...239..375T. 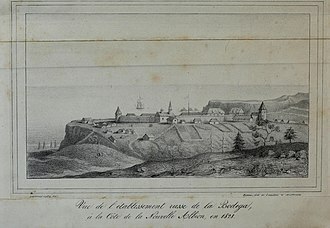 ^ Roulston, M.S. ; Ahrens, T (March 1997). "Impact Mechanics and Frequency of SL9-Type Events on Jupiter". Icarus. 126 (1): 138–147. Bibcode:1997Icar..126..138R. doi:10.1006/icar.1996.5636. ^ Schenk, Paul M.; Asphaug, Erik; McKinnon, William B.; Melosh, H. J.; Weissman, Paul R. (June 1996). "Cometary Nuclei and Tidal Disruption: The Geologic Record of Crater Chains on Callisto and Ganymede". Icarus. 121 (2): 249–24. Bibcode:1996Icar..121..249S. doi:10.1006/icar.1996.0084. hdl:2060/19970022199. ^ Greeley, R.; Klemaszewski, J.E. ; Wagner, R.; the Galileo Imaging Team (2000). 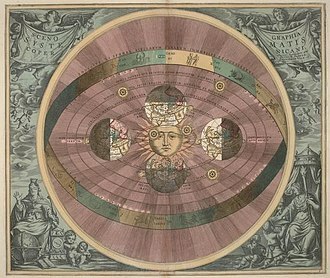 "Galileo views of the geology of Callisto". Planetary and Space Science. 48 (9): 829–853. Bibcode:2000P&SS...48..829G. doi:10.1016/S0032-0633(00)00050-7. ^ "Mystery impact leaves Earth-size mark on Jupiter - CNN.com". www.cnn.com. ^ Nakamura, T.; Kurahashi, H. (February 1998). "Collisional Probability of Periodic Comets with the Terrestrial Planets – an Invalid Case of Analytic Formulation". Astronomical Journal. 115 (2): 848. Bibcode:1998AJ....115..848N. doi:10.1086/300206. For Jupiter-interacting comets of greater than 1 km diameter, a Jupiter impact takes place every 500–1000 yr, and an Earth impact every 2–4 Myr. ^ "PIA01723: Space Radar Image of the Yucatan Impact Crater Site". NASA/JPL Near-Earth Object Program Office. August 22, 2005. Archived from the original on August 8, 2016. Retrieved July 21, 2009. ^ Wetherill, George W. (February 1994). "Possible consequences of absence of "Jupiters" in planetary systems". Astrophysics and Space Science. 212 (1–2): 23–32. Bibcode:1994Ap&SS.212...23W. doi:10.1007/BF00984505. PMID 11539457. ^ Horner, J.; Jones, B. W. (2008). "Jupiter – friend or foe? I: The asteroids". International Journal of Astrobiology. 7 (3–4): 251–261. arXiv:0806.2795. Bibcode:2008IJAsB...7..251H. doi:10.1017/S1473550408004187. ^ Horner, J.; Jones, B. W. (2009). "Jupiter – friend or foe? II: the Centaurs Jupiter". International Journal of Astrobiology. 8 (2): 75–80. arXiv:0903.3305. Bibcode:2009IJAsB...8...75H. doi:10.1017/S1473550408004357. ^ Grazier, Kevin R. (January 2016). "Jupiter: Cosmic Jekyll and Hyde". Astrobiology. 16 (1): 23–38. Bibcode:2016AsBio..16...23G. doi:10.1089/ast.2015.1321. PMID 26701303. Wikimedia Commons has media related to Comet Shoemaker-Levy 9. A Schmidt camera, referred to as the Schmidt telescope, is a catadioptric astrophotographic telescope designed to provide wide fields of view with limited aberrations. The design was invented by Bernhard Schmidt in 1930, a recent example is the Kepler spacecraft exoplanet finder. Other related designs are the Wright Camera and Lurie–Houghton telescope, the Schmidt camera was invented by German-Estonian optician Bernhard Schmidt in 1930. 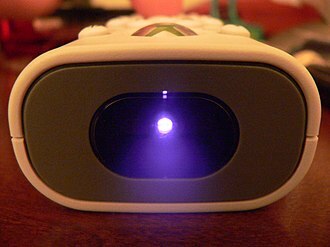 Its optical components are an easy-to-make spherical primary mirror, and an aspherical correcting lens, known as a Schmidt corrector plate, the film or other detector is placed inside the camera, at the prime focus. The design is noted for allowing very fast focal ratios, while controlling coma, Schmidt cameras have very strongly curved focal planes, thus requiring that the film, plate, or other detector be correspondingly curved. A field flattener, in its simplest form a lens in front of the film plate or detector, is sometimes used. Since the corrector plate is at the center of curvature of the mirror in this design the tube length can be very long for a wide-field telescope. Because of its field of view, the Schmidt camera is typically used as a survey instrument. 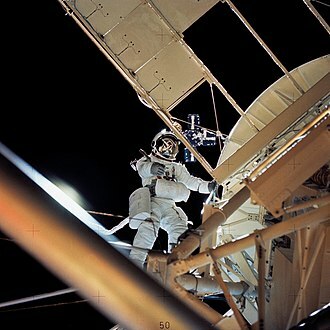 These include astronomical surveys and asteroid searches, and nova patrols, in addition, Schmidt cameras and derivative designs are frequently used for tracking artificial earth satellites. The first relatively large Schmidt telescopes were built at Hamburg Observatory, between 1945 and 1980, about 8 more large Schmidt telescopes were built around the world. One particularly famous and productive Schmidt camera is the Oschin Schmidt Telescope at Palomar Observatory and this instrument was used in the National Geographic Society - Palomar Observatory Sky Survey, the POSS-II survey, the Palomar-Leiden Surveys, and other projects. 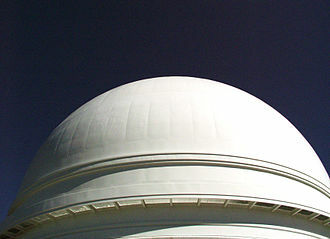 The technical improvements developed during this survey encouraged the development of the Second Palomar Observatory Sky Survey, the telescope used in the Lowell Observatory Near-Earth-Object Search is a Schmidt camera. The Schmidt telescope of the Karl Schwarzschild Observatory is the largest Schmidt camera of the world, a Schmidt telescope was at the heart of the Hipparcos satellite from the European Space Agency. David H. Levy is a Canadian astronomer, science writer and discoverer of comets and minor planets, who co-discovered Comet Shoemaker–Levy 9 in 1993, which collided with the planet Jupiter in 1994. 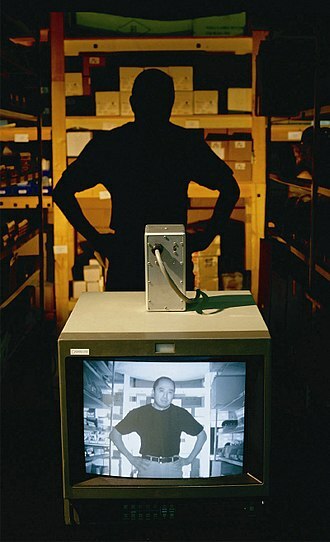 Levy was born in Montreal, Canada, in 1948 and he developed an interest in astronomy at an early age. However, he pursued and received bachelors and masters degrees in English literature, Levy went on to discover 22 comets, either independently or with Gene and Carolyn Shoemaker. He has written 34 books, mostly on subjects, such as The Quest for Comets, a biography of Pluto-discoverer Clyde Tombaugh in 2006. He has provided periodic articles for Sky and Telescope magazine, as well as Parade Magazine, Sky News and, most recently, periodic comets that Levy co-discovered include 118P/Shoemaker–Levy, 129P/Shoemaker–Levy, 135P/Shoemaker–Levy, 137P/Shoemaker–Levy, 138P/Shoemaker–Levy, 145P/Shoemaker–Levy, and 181P/Shoemaker–Levy. In addition, Levy is the discoverer of two periodic comets, 255P/Levy and P/1991 L3. The tidal force is a force that is the secondary effect of the force of gravity, it is responsible for the phenomenon of tides. It arises because the force exerted by one body on another is not constant across it. Thus, the force is differential. Consider the gravitational attraction of the Moon on the oceans nearest to the Moon, the solid Earth, there is a mutual attraction between the Moon and the solid Earth, which can be considered to act on its centre of mass. However, the oceans are more strongly attracted and, especially since they are fluid, they approach the Moon slightly. The far oceans are attracted less, viewing the Earth as a whole, we see that all its mass experiences a mutual attraction with that of the Moon, but the near oceans more so than the far oceans, leading to a separation of the two. When a body is acted on by the gravity of another body, Figure 2 shows the differential force of gravity on a spherical body exerted by another body. These so-called tidal forces cause strains on both bodies and may distort them or even, in cases, break one or the other apart. These strains would not occur if the field were uniform, because a uniform field only causes the entire body to accelerate together in the same direction. In the case of a small elastic sphere, the effect of a tidal force is to distort the shape of the body without any change in volume. The sphere becomes an ellipsoid with two bulges, pointing towards and away from the other body, larger objects distort into an ovoid, and are slightly compressed, which is what happens to the Earths oceans under the action of the Moon. The Earth and Moon rotate about their center of mass or barycenter. To an observer on the Earth, very close to this barycenter, all parts of the Earth are subject to the Moons gravitational forces, causing the water in the oceans to redistribute, forming bulges on the sides near the Moon and far from the Moon. 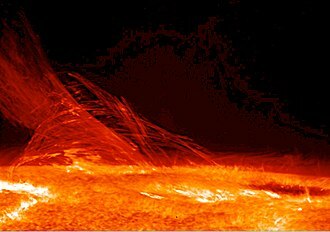 When a body rotates while subject to forces, internal friction results in the gradual dissipation of its rotational kinetic energy as heat. In the case for the Earth, and Earths Moon, the loss of kinetic energy results in a gain of about 2 milliseconds per century. Comet McNaught, named after its discoverer Robert H. McNaught. 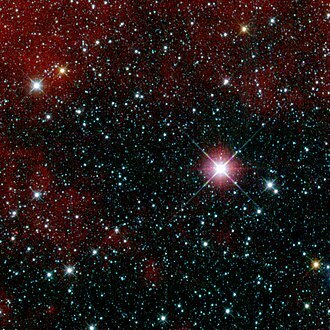 It is also known as the Great Comet of 2007 and has the numerical designation C/2006 P1. Halley's Comet, named after Edmond Halley who first calculated its orbit. It now has the numerical designations 1P/Halley and 1P/1682 Q1. Comet Holmes, named after its discoverer Edwin Holmes. It also has the numerical designation 17P/Holmes. The 2 meter diameter (Alfred-Jensch-Telescope at the Karl Schwarzschild Observatory in Tautenburg, Thuringia, Germany is the largest Schmidt camera in the world. 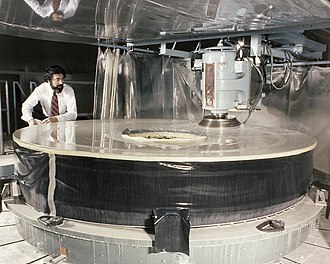 One of the Baker-Nunn cameras used by the Smithsonian satellite-tracking program. Diagram showing the five primary layers of the Earth's atmosphere: exosphere, thermosphere, mesosphere, stratosphere, and troposphere. The layers are to scale. From Earth's surface to the top of the stratosphere (50km) is just under 1% of Earth's radius. This image shows the temperature trend in the lower stratosphere as measured by a series of satellite-based instruments between January 1979 and December 2005. The lower stratosphere is centered around 18 kilometers above Earth's surface. The stratosphere image is dominated by blues and greens, which indicates a cooling over time. Deflection happens when an object hits a plane surface. If the kinetic energy after impact is the same as before impact, it is an elastic collision. If kinetic energy is lost, it is an inelastic collision. It is not possible to determine from the diagram whether the illustrated collision was elastic or inelastic, because no velocities are provided. The most one can say is that the collision was not perfectly inelastic, because in that case the ball would have stuck to the wall. Comet Shoemaker-Levy 9 was disintegrated by the tidal forces of Jupiter into a string of smaller bodies in 1992, before colliding with the planet in 1994.